When I was growing up in the 1970s, my mom stayed home with us, so I figured I knew her about as well as I could possibly know a grownup. My dad, though, seemed a far more elusive figure, slipping out of the house early to start his long commute each morning, and arriving home for dinner each night, often falling asleep on the couch later in the evening, exhausted. Perhaps this "traditional" American family structure is one of the reasons that fathers retain an air of mystery for so many of their children. But one of the gifts and burdens of growing up is that you finally gain the perspective and distance necessary to see both your parents as three-dimensional human beings—their good qualities as well as their all-too-human flaws. 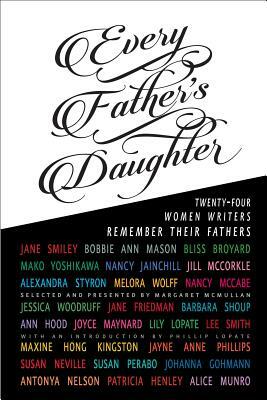 This level of insightful clarity is on full display in University of Evansville professor/novelist Margaret McMullan's new anthology, Every Father's Daughter: Twenty-four Women Writers Remember Their Fathers. In McMullan's foreword—which features a couple of the loveliest moments in the whole book—she talks about the passion for literature she shared with her father: "As he lay dying, all the talk of symptoms, ability and inability, therapists, caregivers, insurance, and healthcare gave way to other, preferable narratives as we read and read and read. I read out loud from all the authors he loved, until his last breath, letting the words and sentences hover in the room for as long as they would stay, like so many invited friends come to say goodbye." Indeed, McMullan notes that when she couldn't read or write following her father’s death, she realized that what she needed was a collection of essays written by women about their fathers. When she couldn’t find one, she reached out to writers who she and her father had gotten to know, or had admired, and asked them to contribute essays for Every Father's Daughter: Twenty-four Women Writers Remember Their Fathers. Some of the featured authors are marquee names: Jane Smiley, Maxine Hong Kingston, Antonya Nelson, Bobbie Ann Mason, Alice Munro, and more. Plus, Phillip Lopate provides the introduction, while his daughter, Lily Lopate, examines her relationship with him in the essay, "A Relationship of Words," and Alexandra Styron reflects on her literary lion dad William in "Reading My Father." In the end, though, this glitz-value matters little, since the quality is consistently high across the collection. In the book’s first of three sections, titled "Absences," Smiley kicks things off with "No Regrets," a piece that demonstrates the power of humanity and compassion. Smiley's father struggled with mental illness—during and after World War II—and thus played no real role in her life as a child. While you might expect Smiley to be bitter or self-pitying about her circumstances, she instead looks back upon her father’s absence as a gift: "A girl who is overlooked has a good chance of not learning what it is she is supposed to do. A girl who is free can grow up free of preconceptions. Sometimes, from the outside, my work and my life look daring, but I am not a daring person. I am just a person who was never taught what not to try." Bliss Broyard's essay, "My Father’s Daughter," tells of the author’s efforts to sustain a relationship with her deceased father's longtime friends. "I want them to view me as their friend rather than my father’s daughter," Broyard writes. "Otherwise, I would never learn anything about him at all. I search out these men to discover the man behind my father, that is who I've come to meet." Though I think the anthology could have been strengthened by the inclusion of more perspectives from women of color, there is nonetheless diversity, in that the essays never start to blend into one another, which is often a problem with themed anthologies. One of my favorite pieces, Mako Yoshikawa's "Secrets of the Sun," chronicles the writer's struggle to come to terms with a Japanese father who had been consumed by his work as a nuclear fusion physicist. Were his scientific pursuits altruistic (making a better future for humanity) or selfish (angling for a Nobel Prize)? Yoshikawa labors to answer this question while remembering awkward get-togethers with her father after she became an adult: "I began to see him as more broken than monstrous." For sheer suspense and storytelling, my favorite piece from the book’s second section, titled "Lost and Found"—in which the writers’ fathers are generally present, but nonetheless difficult to connect with—is Jessica Woodruff's "Crossing State Lines." Woodruff and her five siblings had found themselves in the foster system when her trucker father came for a supervised visit. When he asks Woodruff's foster mother if he can take Jessica for a short ride in the truck, he instead drives her down to Texas, leading to a dramatic arrest that unfolded in front of his young daughter. "Presences" is the last section in the book, and while the essays are largely just as well written as those that precede them—Munro works her usual magic, transporting us into the world of her father's doomed fox pelt business in "Working for a Living"—the pieces in the first two sections, often dissecting highly strained relationships between parent and child, tended to leave the biggest impression on me. Even so, I appreciated Nancy McCabe's "Gifts," in which she reflects on how she felt like the odd man out in her own family. "This is the real reason people have children, I think. Not just to pass on genes or wisdom to the next generation, not just to replace ourselves in the world, but because of the strange and miraculous way that the mere presence of children can heal lifelong fractures. We laugh a lot more. We don't take ourselves so seriously." With Father's Day upon us, it's hard to think of a book that would be more relevant to the holiday. As McMullan writes in her foreword, "We all have stories about our fathers, even if it's a bad story or a non-story, it's a story. If you write, you will read these essays and feel the need to write your own." Or at the very least, feel the urge to call your father. For when I got to the book's last page, I immediately picked up the phone and chatted with my dad for about an hour. Among other things, I asked him about where he was when he got the news of JFK's assassination, and how he felt on that day. It was as though I was suddenly, ravenously hungry for the stories that made him who he is: a man who, in some ways, I'm finally getting to know.